Neil Young News: Yes, It's an Angry World So Where Do We Go Now Neil Young? Yes, It's an Angry World So Where Do We Go Now Neil Young? 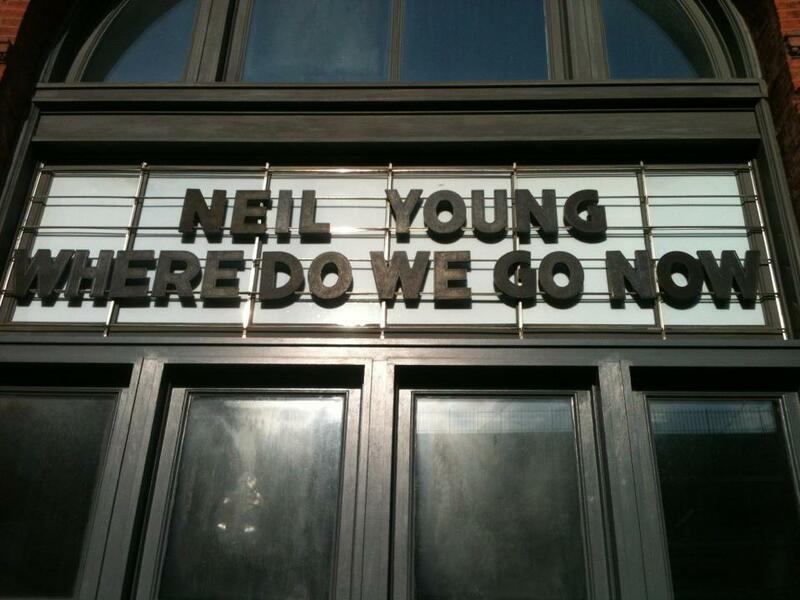 Neil Young: "Where Do We Go Now"
We posted this way back in 2013 and it still seems appropriate in light of recent developments -- sadly. The original 2013 posting was made in response to fans reaction to the cancellation of the Crazy Horse tour dues to Poncho's hand injury. To say we were apalled by the insensitivity of some our fellow fans is an understatement. As both Billy Talbot & Ralph Molina have written, Crazy Horse is a team, a unit, a band of brothers. So, when asking "Where Do We Go Now? ", consider that when Poncho injures his hand, it's almost like Neil has injured his own hand. He can't play a Crazy Horse show without the whole team. Likewise today. We're all on the big human planet team and we'd all better get along or we all go down together. We are not helpless. Remember, Fear Not! We'll Always Have Paris. Forever. Actually, there is nothing to fear. It's just Winterlong ... It's all an illusion. (Yeah, yeah, it's all just one big giant conspiracy right, Thrasher? Well, maybe it really is so.) So wake up while you still can and turn off the TeeVee. Find the cost of freedom -- it's expensive but worth it. What we saw back in 2013 left us shaking our heads in our little microcosm rustie world -- which is merely a reflection of that larger angry world. But if we can deal with our anger at the local level, then there's a chance for the big world wide web of life. But even more disturbing for us is the amount of near rage and hatred that some are expressing in various forums over a concert cancellation. We say this because if only this outrage and energy could be channeled into some truly consequential matters like say war, environment or poverty to name a few. Seriously. Do folks who have acted like they have experienced a massive injustice take the same approach with their local elected officials whenever they feel wronged? Let's hope so. So channel all that rage towards something useful where you can actually make a difference. All change is local. Don't get all swept up in this global cataclysm seemingly unraveling before your eyes. It's always darkest before the dawn -- and we're almost to a glorious sun rise. It's an "Angry World", indeed. "Some see life as a broken promise Some see life as an endless fight They think they live in the age of darkness They think they live in the age of fright It's an angry world And everything is gonna be alright"
PS - Here is a Comment of the Moment in response to original 2013 posting on It's an Angry World So Where Do We Go Now Neil Young? Thanks Tim. Fair question. We're inferring a lot here. Connect the dots. As stated, it's based on an original post from 2013 when folks went ballistic over the cancellation of the CH tour. Yes, It's an Angry World. But it doesn't have to be. "You can make a difference, If you really a try"
Monsanto surely not the main issue facing the planet? @Andy - Sure Monsanto is a problem. No doubt. Telling me I got to beware." While it has become increasingly clear exactly what is happening, there are now far more men with guns everywhere telling us all to beware. Same as it ever was. Same as it ever was. Same as it ever was. It's all just a repeat of the 1960's, obviously. Same exact playbook script. civil wars & helter skelter. Thanks Single Malt. A good and wise lesson. We're trying not to feed the angry world with our energy and bring a little light to the rusties of the world. "Godsave the dawn of man, which is once again imminent in the cyclic time-reversal mode." "Out of 6 billion humans, the trouble makers are just a handful." "We must accept finite disappointment, but never lose infinite hope." Thanks Mr H, as always for the thoughtful "Words". ps - actually, we don't need more "Words" as much as we need more folks to follow through on the "Words" with actual "Deeds/Actions".